I have received complaints that the last post had a lack of passion and felt like it had been written in a five minute rush before I dashing off to catch a waiting train. Well yes that is correct so there. I will try hard next time (x100). So recently in order to march for a couple of hours on a Climate Change protest, I spent nearly 8 hours on a diesel powered coach belching out it’s toxins all the way across the country from Sheffield to London. There has to be something wrong with that. The great and good would say you only get things done if it’s a big protest in one place but maybe it should have been in Birmingham or Manchester so slightly closer for a greater proportion of the population? Anyway I (well Chris) spotted a huge behemoth of a power station on the way down which I duly snapped. When we got there it was the usual gang of left wing organisations (Socialist Workers, Communist Party of UK) and of course all the “Green” parties. There were even speeches from the new brand-spanking new “green” (small-c) conservatives and the Liberal “we don’t want cheap flights but we want more airports and motorways” democrats. The protest was medium sized and incredibly quiet (especially comparing it to the anti-war protests of a few years ago). Didn’t manage (nor want) to see much of Razorlight but was gutted that while Rob Newman was talking about protesting against HBOS (who are funding some arctic oil pipeline), two woman infront of me couldn’t stop yapping about last night’s dinner. Monbiot stole the show in my opinion, saying we need to stop protesting and start doing. He said everyone should get rid of their TVs and spend that “wasted” (hear hear) time getting friends, family (and soon to be enemies and former members of family) to come on the climate change express and get involved. We’ll see! 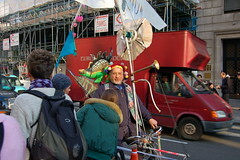 Does anyone remember the bike man (picture below)? He was there on the anti-war protests and got into trouble with the law for cycling in Hyde Park. However a hefty dose of people power got rid of the fuzz after a short while, they crept away with the batons between their legs. I’ll try to find the other photo I have from February 2003… It’s not… gasp… digital! Previous PostMushrooms, Cartoonists, Warehouses and GeordiesNext PostBack to Reading!